Range of forward curved belt drive cabinet fans manufactured from galvanised steel sheet, internally lined with melamine thermo-acoustic insulation. All models incorporate a double inlet low pressure centrifugal fan mounted on anti-vibration mounts and flexible coupling at the discharge. Supplied as standard in horizontal discharge (code H) configuration with motor, pulley and belt assembly on the right hand side of the unit when viewed from the discharge end. Three phase 230/ 400V-50Hz, up to 3 kW. 230V-50Hz, with a maximum of 1,5 kW (CVTB version). 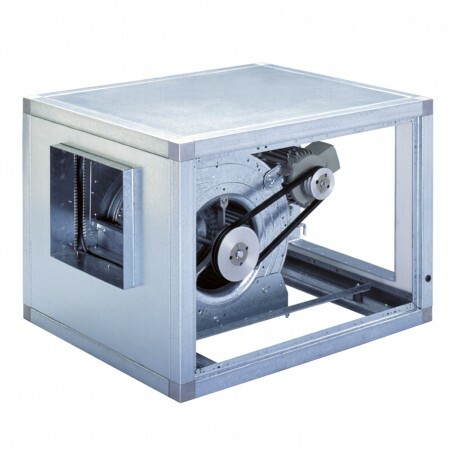 All motor up to 2,2 kW are mounted onto the fan casing scroll. The belt-driven assembly can be supplied at the left hand side of the unit (TI version), Vertical discharge (code V) configuration. Models fitted with circular inlet flanges. Double thickness (double skin) panels (17 mm). To select CVTT refer to performance curves, or Easyvent. 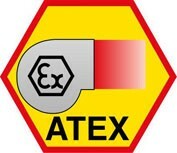 The consumption data (A, W) of ATEX products may vary from the data shown in technical characteristic charts."